A major QTL for grain dormancy, QPhs.ocs-3A.1, derived from the highly dormant wheat Zenkoujikomugi (Zen), has been identified in a study made under a controlled environment. 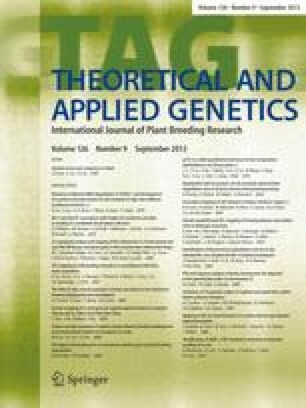 Further investigations were needed to dissect the precise position and expression of QPhs.ocs-3A.1 under different field conditions because the ability to detect genetic loci for grain dormancy traits is compromised by environmental effects and genotype/environment interactions. Group 4 chromosomes have also been shown to be possible sites of QTLs for grain dormancy. The objectives of this study were (1) to locate additional molecular markers in the QPhs.ocs-3A.1 region, (2) to identify QTLs on the group 4 chromosomes and (3) to elucidate their combined effects. We examined the recombinant inbred lines (RILs) from a cross between Chinese Spring (CS) and Zen over a 3-year period in one location and 1 year in a different location. In an interval mapping study QPhs.ocs-3A.1 was mapped to within the 4.6 cM region flanked by Xbarc310 and Xbcd907 at the proximal end of the short arm of chromosome 3A. QPhs.ocs-3A.1 was confirmed to be the predominant dormancy QTL since it explained a large portion (11.6–44.8%) of the phenotypic variation, and was strongly displayed under dormancy-breaking conditions or at low germination temperatures. For QPhs.ocs-4A.1, identified on the long arm of chromosome 4A, and QPhs.ocs-4B.1, on the centromeric region of the long arm of Chr 4B, the LOD peak positions and the desirable allele were consistent between the trials, while the LOD scores and contribution to the phenotypic variation varied. Transgressive segregants were observed among the 125 RILs and most of them had a combination of the three alleles conferring a higher dormancy: the Zen alleles at QPhs.ocs-3A.1 and QPhs.ocs-4A.1 and the CS allele at QPhs.ocs-4B1. This demonstrated a combined effect of the desirable alleles on accelerating grain dormancy, with their total effect being superior to that of Zen. RFLP clones were kindly provided by the USDR-ARS Central Probe Repository, Albany, Calif., USA; Dr. M.E. Sorrells, Cornell University, N.Y., USA,and Dr. M.D. Gale, John Innes Centre, UK. The aneuploid stocks of the CS ditelosomic lines for group 4 chromosomes were a kind gift from Dr. K. Noda, Research Institute of Bioresources, Okayama University, Japan. This work was supported by funds from the Ministry of Agriculture, Forestry and Fisheries of Japan for the project ‘New cultivar breeding for high quality and early maturation, and development of techniques controlling high quality in wheat and barley’.